This year has seen more than its fair share of remasters, and it looks like we are about to get one more. Dark Souls II, the game that has bested more than a few gamers on the PlayStation 3 is back with Dark Souls II: Scholar of the First Sin. A PS4 remaster that includes upgraded visuals, additional content and even a reworking of its enemy placement that is sure to spill some blood…again. Longtime fans of the game will find that most of the experience is the same as it was on the PS3, but with a few key differences that really does bring in more fresh air than we have seen from other remasters. Instead of simply porting over the exact same experience, From Software have masterfully reworked a number of the enemy locations which makes returning to the world of Drangleic a somewhat fresh experience. While the layout may be the same, what is lurking around the corner might not be. Having already put in a number of hours into Dark Souls II on the PS3, I was able to get my bearings quickly and move through the opening sections of the game. That was until I started preparing for the first major fight that gave me an issue the last time I played the game. As I grinded out a few levels and approached the lair of my foe, I learned that this wasn’t going to be the Dark Souls I remembered; he wasn’t there. Moving forward, the mixture of known ambush spots being different, and even a boss showing up where I don’t remember him being, made it hard to trust my existing experience. This play on existing memories is one of the best aspects of Scholar of the First Sin, as even item locations are not laid out the same way they once were, causing your own expectations to work against you. Thankfully, with the inclusion of new placements and the addition of the three DLC packs: Crown of the Sunken King, Crown of the Old Iron King and Crown of the Ivory King, players new and old will find something to keep them busy. 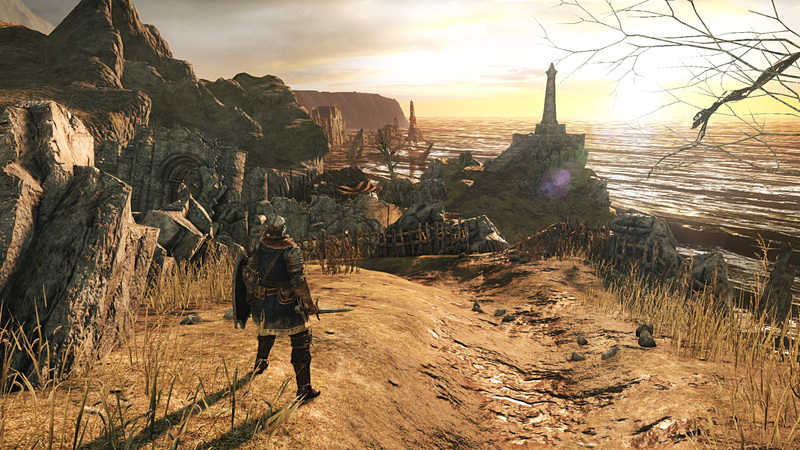 Players unfamiliar with the design mechanisms that have made Dark Souls II so popular, should know that this game still harbors many, if not more, things that are simply looking to make your experience a painful one. Unlike many other titles that simply look to make you feel awesome for accomplishing something everyone else can, this one sets out a challenge and never gives an inch. This puts a great deal of stress on the foundation and core mechanics of the title, and thankfully Scholar of the First Sin not only delivers like the original, it improves upon it. Besides the changes in content, the most notable differences in Scholar of the First Sin is in how it looks and plays. Given its roots on the PS3 generation, there are still some limitations in how current-gen the title can look, especially given some of the character models that are still being used. But, overall, most of the game does look great, and the effect that the improved lighting and high resolution textures have on the game is drastic. Items like metal now have a subtle glimmer that give them a realistic look, and the role that plays in selling a world filled sharp objects is important. On top of that, Scholar of the First Sin also runs at an impeccably smooth 60fps (frames-per-second), and while I am not normally someone who gets caught up on frame rates, it does improve the experience significantly. For a game that relies so heavily on the response of its control mechanics and the players ability to dodge, the buttery gameplay keeps things solid from the ground up, giving players a stronger foundation to work off of. Sadly, this is an issue that I feel needs to be brought up. As with the first launch of Dark Souls 2, a great deal of understanding goes into its pain-by-design and the limitations of the hardware it was designed for. With Scholar of the First Sin I found it difficult to not pick apart its stringent rule set that it anchors around your neck, and see that I just wanted more out of a modern title. The speed and pacing of your character, while smoother than before, does feel a bit more dated than it did when it originally released. Whether it’s just modern expectations, or simply the fact that my time with the series has run its course, I am not sure, but I repeatedly found it difficult to not be frustrated with my character moving like a 90-year old man, and some of the game’s hit detection issues that it brings from the original release. Rolling out of the way of someone about to impale you on the end of a spear or sword, only to watch your character teleport onto the weapon after having it miss you is, to say the least, aggravating — especially for a game that punishes you for every death. This leads me to an aspect about games like this that I find difficult to pin down exactly, as many of the quirks of Dark Souls II are considered design choices that define the rules and establish the difficulty of the game. Such as when you die, you permanently lose a portion of your life, unless you use a rare item to cancel the penalty. A design choice that adds to the tension of each battle, but at the same time forces players to play it safe more often than not, and as mentioned early, highlights moments when death is unwarranted. While it is easy to say that these aspects have ruined the experience completely for me, it wouldn’t be the truth. Dark Souls II2e has always been about overcoming the impossible, and while some aspects of the game are less than what I would call optimal, it does establish a clear set of rules and it does hold fast to almost all of them. Figuring out how to best an opponent who is vastly more powerful, and being able to cross them off my list is still a challenge I want to take on. Players who have played Dark Souls II for an extended period, as well as all of the DLC may find that the rearranged enemy and item placement enough to get them fighting for their soul once again, but only if they are die-hard fans. If you haven’t played the original or you were stopped a bit short the first time around, Scholar of the First Sin is the perfect excuse to come back and try your hand at the experience again. The new additions and visual upgrades make this the best version to play the game on. Review copy proved by the publisher. For information on scoring, you can read our Review Policy here.